Bénédicte Pansier has been the Director of Knowledge Sharing at the Mérieux Foundation since March 2018. 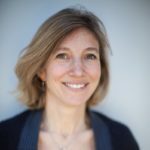 She has also been managing Les Pensières Center for Global Health in Annecy since 2016. Her mission is to foster knowledge sharing and exchanges among experts, researchers, health professionals and humanitarian workers worldwide. Bénédicte has more than twenty years international experience in partnerships, marketing/communication, fundraising, external relations in the private sector, in non-profit organisations (UN, NGOs, Foundations) and in the academic sector. From 2010 to 2016, before joining the Foundation, Bénédicte worked for public health organisations and the University of Lugano, Switzerland; firstly, focusing on diabetes and non-communicable diseases and later, focusing on vaccinations and social mobilisation. Between 2003 and 2010, she worked for the United nations World Food Programme in Rome, Italy, in order to establish private-public partnerships to fight global poverty and hunger.